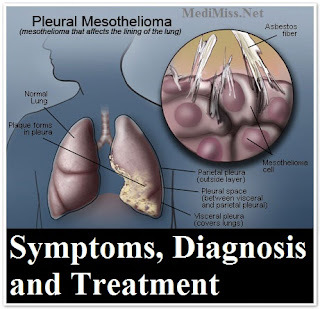 Pleural Mesothelioma is the most common type of mesothelioma which is characterized by the formation of cancerous tumors in pleura which is the protective lining of lung surrounding the chest cavity and diaphragm. 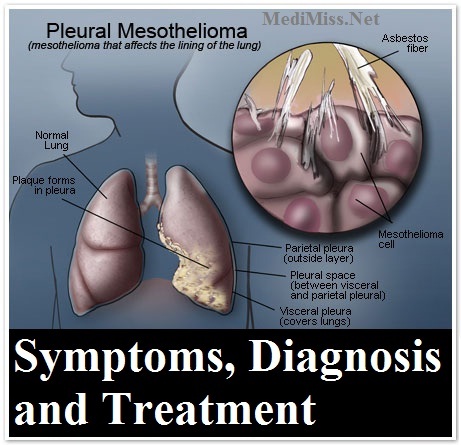 Like other types of mesothelioma, pleural mesothelioma is also connected to asbestos exposure. Once asbestos fibers enter the body through inhalation they lodged on pleura and start changing its nature after passing one or two decades. These changes occur in the form of irritation and inflammation which results in the formation and proliferation of cancerous cells. Such developments lead to pleural thickening which further aggravates the condition by building fluid in chest cavity. Fluid building in pleural cavity put pressure on lungs and makes it difficult to breathe easily. At this stage patient feels that something is going wrong in its chest region which is creating problem in normal breathing and causing persistent pain and cough for him. In order to diagnose pleural mesothelioma imaging techniques including X-rays, MRI and CT scan are applied along with taking patients' medical history and current health state into account. All these measures helps in diagnosing the presence of cancerous cells inside the body and level of damage already occurred to pleural lining. If necessary then biopsy can also be recommended to take out the sample of fluid building around pleura through minor surgical process. This sample is then tested into laboratory in order to trace the presence of cancerous cells inside pleural cavity. The selection of treatment method depends upon the health condition of the patient and level of damage occurred to his body. Early diagnosis makes it easier to treat mesothelioma. So if anyone is feeling above mentioned symptoms then don't take it easy and take an appointment with your physician to find out the actual cause of this internal body disturbance.